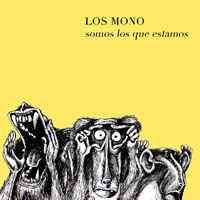 New album from Chile super-funksters 'LOS MONO'. "Somos Los Que Estamos" (US CD release) is available now here at the Sonic360 store! Los Mono's new album is pure funk-fuelled positivity which will get you dancing through the summer. Not only is Somos Los Que Estamos a full on high-energy blast from start to finish, the album is an adventure with a moral message; promoting creativity, originality, positivism, and self-responsibility. In fact, the conscious lyrics and upbeat vibe are the perfect compliment to an album that is driven from start to finish with a myriad of crunchy lo-fi beats n bleeps, infectious melodies and pure monkey-fuelled inspiration.